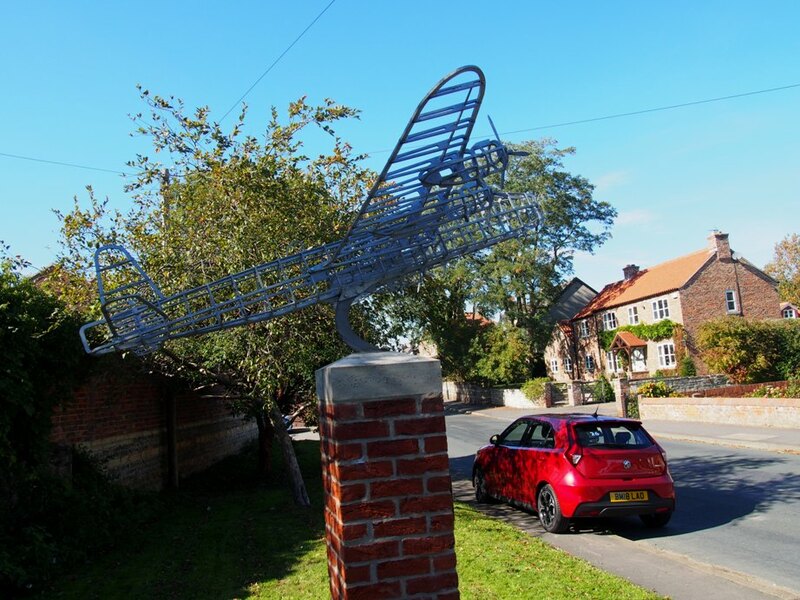 A unique and very distinctive memorial caught the eye while working at the annual SMMT Test Day at Wetherby. 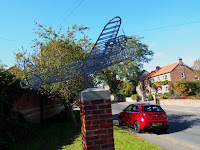 While driving through the North Yorkshire village of Tockwith, with a motoring journalist colleague from the Greenock Telegraph, we stopped to have a look - which prompted a Google search this morning. This memorial was erected just 3 years ago to mark the 70th anniversary of an event which happened two months after the close of World War 2 in 1945. A young, but experienced, pilot was returning to the nearby RAF Marston Moor airfield at the conclusion of a night training flight when it was reported and recorded that his Stirling bomber aircraft stalled and crashed into the village of Tockwith. All six members of the flight crew were killed and one villager, although given the serious nature of the crash and the amount of devastation caused to homes, the local folks were indeed fortunate to have escaped a much worse tragedy. But what caught the eye was the name and title of the first casualty on the memorial plaque inscribed above the names of the flight crew. It was the local postmaster Arthur Carlill who had been in bed above his Post Office on that fateful night when the aircraft crashed into it and demolished it. Coincidentally, just outside Tockwith to the east of the village is Marston Moor, the site of a much more bloody event where the Parliamentarians clashed with the Royalists during the English Civil War in the 17th century. The battle commenced around 7.30pm and by midnight around 4,500 soldiers were lying dead or fatally wounded on the field with the Parliamentarians under Oliver Cromwell claiming a famous victory. Four and half thousand soldiers slaughtered in the dark on a barren English moor in four and a half hours. It doesn't bear thinking about, eh? But here's the thing, the Scots were very much involved in this 'English' Civil War as the 11,000 strong Parliamentarian army was bolstered by 13,500 troops and cavalry from the Scottish Covenanters. 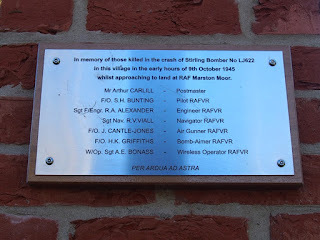 We stopped at that memorial too, but somehow the Tockwith air disaster memorial affected us both more. We were both silent in the car for a quite a few miles after that. 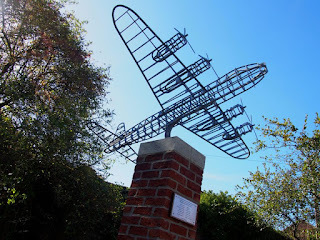 Perhaps it had something to do with the evocative skeletal metal sculpture depicting a Stirling bomber in flight. A nice touch were the fresh and well cared-for flowers growing in containers around the base of this memorial.